Benedictine College visited Germany and Austria, starting off in Munich where walking tours of the city were followed by a visit to the Dachau Memorial. On the fifth day, the group crossed the border into Austria, visited the Swarovski crystal factory and museum, toured historic Innsbruck, visited the Berigsel ski jump and saw the Neuschwanstein Castle. Benedictine College produced an impressive second half comeback to rally from a 13-point third quarter deficit to beat European powerhouse the SWARCO Innsbruck Raiders 31-27 in Austria. 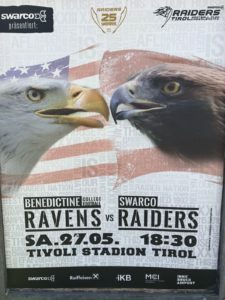 After a scoreless first quarter, the Ravens trailed 7-0 after Raiders quarterback Sean Shelton ran 4 yards for a touchdown and Thomas Pichlmann tagged on the extra point before increasing the hosts’ lead to 10-0 with a 28-yard field goal. Benedictine College replied as Charles Nihart found the end zone from a yard out and a Sam Vitulli PAT reduced the deficit to three points. Pichlmann split the uprights again, this time from 27 yards out, to put the Raiders 13-7 ahead at halftime. SWARCO looked to be heading towards victory when Shelton hit Platzgummer for a 15-yard touchdown and the reliable Pichlmann tagged on the extra point and the Austrians led 20-7 in the third quarter. Another Nihart rush, this time from 15 yards out and a Vitulli conversion pulled the Ravens back into contention then Nihart’s third rushing score of the day tied the game at 20-20. Logan Harris put the visitors ahead for the first time with a 15-yard reception from Shaefer Schuetz, who then connected with Zach Renfro for a two-point conversion and a 28-20 lead. The Raiders pulled to within a point as Tobias Bonatti scored on the ground from two yards out and Pichlmann was true with the PAT. The decisive score came in favor of the visiting Ravens as kicker Vitulli nailed a dramatic 38-yard field goal with only seconds remaining for the narrow win.